Here's a quick one done with the palette knife. Quick Self Portrait & my 500th post! Had the pleasure of being interviewed on the CBC show Connect with Mark Kelley tonight. 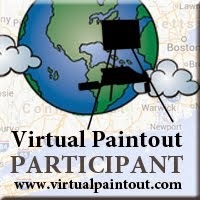 Talking about my project I call the Virtual Paintout. I'm adding a link. Slide the bar over to about the 49 minute mark. The interview last for about 5 minutes. Pretty exciting. Wonder how many folks watch the show? A quick post of my latest. I'll replace this with a better pic when I get time. 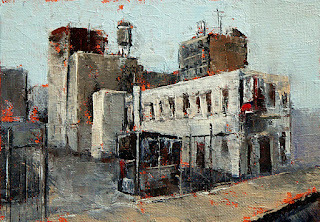 Here's a quick 45 minute painting done with knife and a little finger work. And no, it's not Rock City outside of Chattanooga... it's Detroit.